The Mercian Models range of small industrial locos are reasonably priced but for me to get the best out of the one I built i needed to make a few adjustments to how it went together. Again I'm not going to give a step by step of how to build the kit as that is mainly straightforward. But because I needed to run it with a loksound decoder I decided to make it in parts that could be easily broken down again if necessary. Here is the chassis with the lower body resting on top of it. The motor and gearbox supplied sits comfortably if somewhat snugly almost into the cab. (I had to discard the motor arrangement as it proved inferior, but more on that in a little while). The arrangement of the crossheads slide bars and piston chambers was very tight and to alleviate this I had to pack out the cylinders as shown here. This also meant that the motion brackets had to be cut and adjusted to make the slidebars parallel to the chassis. Once this had been done all as ok. The chassis members are quite thin and care has to be taken in getting the chassis square and true. This image shows the three parts of the body and chassis that will be screwed together. There is plenty of room in the saddle tanks for the loksound decoder and its speaker. 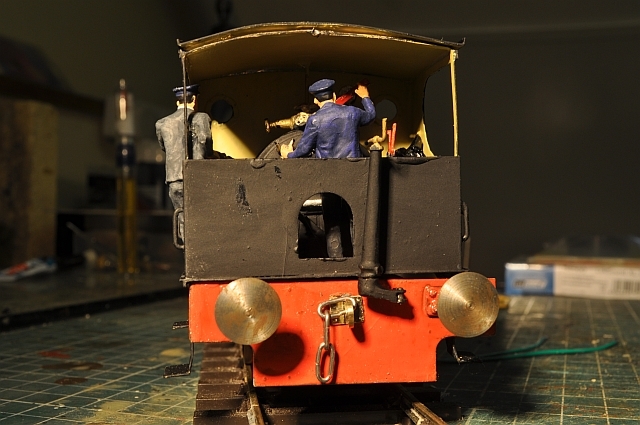 BUT in running in the valve gear and wheels there were major problems. First the gering supplied was strung on a flimsy brass bracket arrangement and I've fallen foul of this before as it means that the cog and worm are likely to foul each other as the frame gives under pressure. Once this happens it only gets worse with brass dust appearing round the gear wheel and the worm slipping. The only way forward is to remove the motor and gearing, (mine had rusted in from solder flux corrosion so had to be cut out and i will be replacing the whole unit with an MSC models reduction gearbox which is made from a solid brass form and won't distort! Here is the loco with all parts together. The valve gear and motion all work correctly so just waiting for the new motor and gears and fitting the DCC decoder and it will be ready for work! Sorry about the 'fluid nature' of this video. uTube detected that it was shaky and that they could improve it. Hence its appearance. I will make another to replace this at some time so its not you having a funny turn!